Over the past three years, The Carter Center, in partnership with the Nigeria Ministry of Health, has introduced an innovative way of simultaneously treating several parasitic diseases in Nigeria. 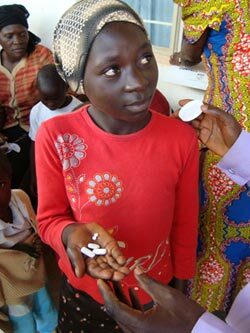 In this approach — known as triple-drug treatment — a health worker gives a community member three different medicines at one time that in combination treat river blindness, lymphatic filariasis, schistosomiasis, and several kinds of intestinal worms. In the interview that follows, Frank Richards Jr., M.D., who directs the Center's programs for fighting these diseases, discusses the benefits of the triple-drug approach. Q: Why is triple-drug administration a good fit for the Carter Center's work? FR: The Carter Center tackles neglected diseases, which are often found together in the same very remote and impoverished communities. 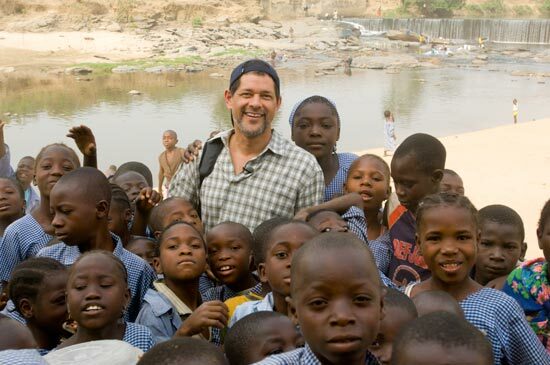 In Nigeria, for example, many communities are endemic to multiple diseases at once, including river blindness, lymphatic filariasis, and schistosomiasis. For many years, we had been thinking about how we could bundle services, essentially piggybacking the distribution of other medications through our existing system for treating river blindness. Q: Integrating drug distribution seems like common sense. Why did it take so long for this approach to be used in the field? FR: First, you have to know it's safe to give someone all of these medicines at the same time. It wasn't until 2006 that enough research had been done to support the safety of administering these three drugs simultaneously. But there were also logistical hurdles.We had to carefully map out the communities where this approach would be used, ensuring that the people there did indeed have all three diseases.
" I took this picture of this 14-year-old girl in Nigeria late last year. She's holding five different tablets — two Mectizan tablets, one albendazole tablet, and two praziquantel tablets. She had the same great smile on her face before she took the medicine and after she took the medicine. She looked the same, but for me, there was a big difference. Before she took those tablets, she had up to six different parasitic infections, but after she took them, she didn't. Her smile was a healthier one after that quick act of swallowing." The next challenge was to make sure that the volunteers who would be distributing the three medicines in their villages could do so correctly. Q: Is triple treatment itself difficult? FR: It can be confusing. A person may need two of a certain tablet, one of another tablet, and two of yet another tablet. To prevent error, we created a color coding system where the bottles with each different medicine are spray-painted a different color on the top, and the dosing poles — which measure dose by height — are painted to match the bottles. We studied this approach very carefully and found that the dosing errors were under one quarter of 1 percent. Q: How have community members responded to triple treatment? FR: One of the first things we were concerned about was how people would react when they had in their hand six tablets to take. But I have been impressed by the attitude of the community members. They trust us because we've been working there for many, many years, and they've seen the impact of these medicines on their lives and on their well-being. Q: It's obviously more efficient to distribute three drugs at one time, rather than in separate visits. Can the impact of triple-drug treatment be quantified? FR: Our initial studies have shown a savings of about 40 percent, in terms of the reduction in the cost of gasoline, training, and all of the other things that go into the distribution of medicine. All of our donors for these medicines have really stepped up to make everything happen when the communities need it, which sometimes requires them to coordinate production and shipping schedules. I also think the communities appreciate fewer drug distribution days, so they can spend the rest of their time in the fields or with their cattle. 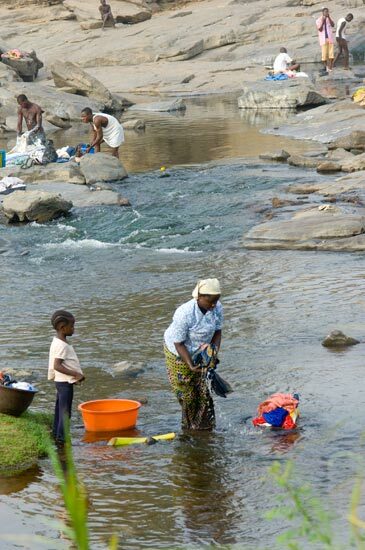 In Nigeria, rivers provide water for a community's every need — bathing, laundry, swimming. They also provide a breeding ground for the black flies that spread river blindness and the parasite that causes schistosomiasis. Health workers in Nigeria measure a girl's height to determine proper dosage of medication. River blindness is treated with an annual dose of Mectizan (donated by Merck & Co., Inc.). Lymphatic filariasis is treated with an annual dose of a combination of Mectizan and albendazole. 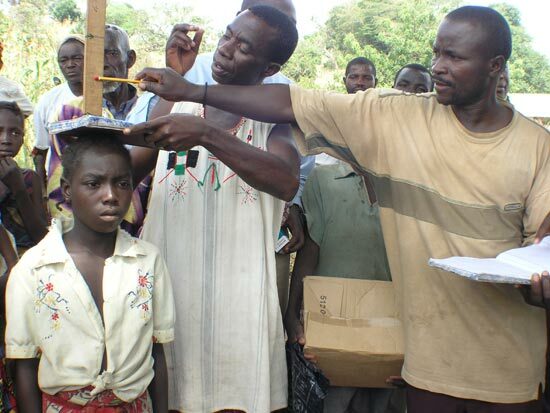 Schistosomiasis is treated with an annual dose of praziquantel. In addition to drug treatment, community members receive health education about the diseases and their causes.